School and College Performance tables are available here. Core subjects of English, Maths and Science have gained 100% pass grades with 70% of all grades being at Grade 4 and above. Subject specialists have seen incredible achievements with 20% of grades in English and 15% in Maths at Grade 7 to 9. Since 2014, Sir John Talbot’s School has gone from strength to strength and is opening its doors to the largest Year 7 and 12 cohorts since becoming an academy as part of the Marches Academy Trust. 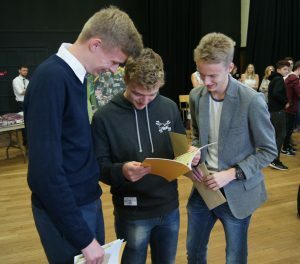 A number of younger students took part in this year’s GCSEs with two-thirds of our year 10 students obtaining grades 4-9 in English Literature. In addition, Year 9 students took part in their Languages GCSE achieving top marks, which sets them well on the road to starting their other GCSE subjects in September. Sir John Talbot’s School, Whitchurch is yet again celebrating outstanding results. 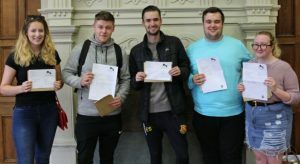 Students reaped the rewards for their hard work with 100 percent pass rate across 17 subjects, and more students than ever going on to university courses. Students have gained access to their first choice courses at top universities including Bristol, Liverpool and Portsmouth. This years’ incredibly successful cohort are set to follow a wide range of degree programmes, including Medicine, Bio-medicine, Architecture and Engineering. The majority of students will take up university places in September, with all students securing a quality pathway including the armed forces, nursing and policing. With an equally outstanding set of AS results in Year 12 this looks set to continue next year.